When the fishing gets tough, finding funnel and neck-down areas on a body of water can be the ticket to consisting bass fishing. Finding funnels is also an effective big bass strategy for trophy hunters and knowing how to find and effectively target these areas will make you a better angler. Foul weather is usually a bummer, but a recent visit to Grosse Savanne Lodge in southwest Louisiana found cold front conditions spotlighting a scenario that’ll produce anywhere you find it. Specifically, my group fished a 480-acre manmade Miller Lake comprising large inner flats surrounded by a network of canals with dozens of cuts linking the waterways. With 15- to 20-mph winds shoving water through those passages, we frequently found fish stacked in and around what Bassmaster Elite pro Bill Lowen termed “blow-throughs.” As the Indiana angler explained, these areas funnel baitfish through narrow gaps where opportunistic bass capitalize on the easy pickings. Now Grosse Savanne’s 4 lakes are private waterways well worth a visit, but you’ll find similar funneling scenarios between natural islands, large reed heads, gaps in western tule berms or Mississippi Delta Roseau cane, breaks in levee walls and wherever channelization has yielded spoil banks. For each, consider a handful of key points. “I think a fish in this scenario is an easy fish to catch because he’s in there to feed,” Lowen said. That’s good news for anglers, as it’s basically a pick-your-poison deal. We caught loads of solid fish on Strike King Hack Attack Swim Jigs, KVD 1.5 square bills and the KVD Popping Perch. Not to say a slower presentation wouldn’t produce, but the fish in funnels are used to chasing down moving targets, so show ’em what fits the scenario. It’s important to play the wind by fishing the down-current sides with presentations that bring your bait through the gap in natural form. Also, be aware that shallow inner areas will warm and cool faster, so the outflowing water will vary in temperature — and often, clarity. Consider the bass’ seasonal needs and fish the areas with optimal water. Upsizing your baits (weight) can help maintain a presentation lower in the water column. As Louisiana stick Greg Hackney pointed out, early mornings found us faring best from the center of the blow-throughs to the deeper, outer side. Given the chilly overnight lows, that shallow inner pond water had lost several degrees and the fish weren’t having it. Conversely, as days warmed, we often found prespawn fish pushing into the shallow zone, so longer casts to the insides of the passes did the trick. Lowen’s keen to spot clumps of grass, reeds, laydowns, stumps and any point of cover and current break from which bass can more effectively utilize these blow-throughs. Hackney was quick to key in on the fact that a lot of his bites came near the stakes marking the drop-offs where spoil banks dropped into manmade passes. A general reference point, no doubt, but here and in natural blow-throughs, he wants to locate the juice. Our second morning on Grosse Savanne was your typical cold front stuff with moody skies and that damp, chilly stuff that sends folks to the pharmacy. Well, if we weren’t liking it, I don’t imagine the bass were thrilled, so when Lowen spotted a sizable junk mat flanking the leeward side of a spoil bank, he knew just what to do. Pulling out his flipping stick, he sent a Strike King Rodent rigged on a 5/0 Hayabusa flipping hook with a 1-ounce Reins tungsten into the darkness. It only took three shots to find a taker. So, look around your areas and where you find wind or tide-born current piling through a narrow gap, you can bet there’s a pile of hungry fish leveraging the buffet on the nearest cover. GIANT Brown Trout Shatters Missouri State Record! This just in: The Missouri Brown Trout State Record has been broken! 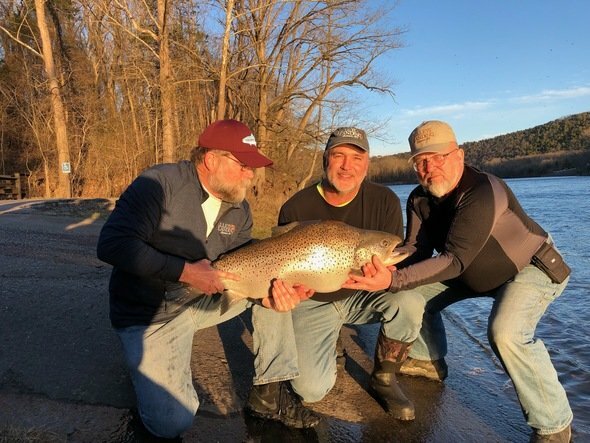 Paul Crews was fishing the annual Vince Elfrink Memorial Trout Tournament on Lake Taneycomo with a conventional rod and reel (not a fly guy) when he hooked into a behemoth of a fish. The colossal Brown Trout weighed 34-pounds and 10 ounces breaking the previous state record by over 6 pounds! Catching a personal best during competition is cool, but, breaking the state record while entered in a tournament with your buddies is something that fishing dreams are made of. Congrats to Paul on his record-setting catch and a special shoutout to his net-man Jim Rayfield for scooping up the fish. Much like a placekicker in the NFL, the person handling the net can become a hero or a villain rather quickly, so kudos to old Jimmy.